It is Gerran’s first week in China. He has never been to Beijing or Shanghai; Chengdu is the first city that he has seen. Now he is on the highway riding to Meishan, a third-tier city an hour’s distance from Chengdu, to teach a dance workshop. Gerran is not the only American choreographer in China these days. Chinese dance studios have been thriving, fueled by the attendance of young middle class Chinese students with disposable income and thirst for American dance culture. Popular contemporary Chinese choreography – the type featured in music videos, commercial events, and the majority of recreational dance classes – derives almost entirely from trends in the West, and studios that have been able to capitalize upon that Western cosmopolitanism have succeeded in the market. 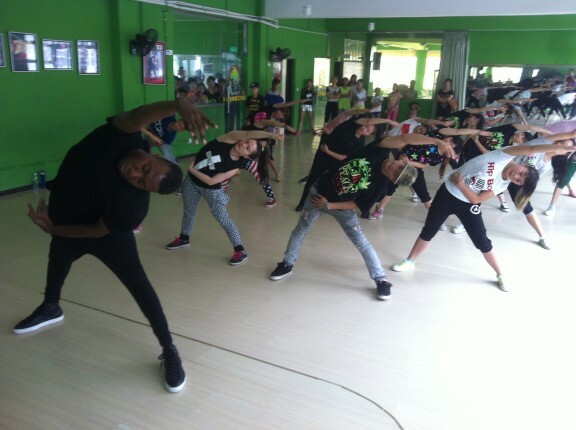 Gerran came to Chengdu from LA with another dancer, named Josh, who has been to China before. Last year Josh crisscrossed China with the Chinese pop star Amei, as a back up dancer in her tour production, and taught a series of workshops at the Chengdu studio Sinostage, which is currently hosting both he and Gerran. Hosting international master classes has become increasingly frequent at fashionable studios across China. Studios like Sinostage in Chengdu, SDT and Team Invader in Beijing, Hip Hop Gang in Henan, and Diamond Freak in Guangzhou have all hosted foreign choreographers in recent months, generating buzz in a social mediascape full of Chinese youths sharing dance videos. Since Youtube is inaccessible to most Chinese, videos posted by dance studios on Chinese sites like Youku are some of the only glimpses into the world of American dance available to many aspiring local dancers. For American dancers visiting China, there are benefits as well. Established names – dancers who have choreographed routines for US pop stars, or appeared in in their music videos – can garner impressive hourly wages teaching master classes. Less well known dancers – those still rising through the cutthroat ranks of the US entertainment industry – can travel abroad for free, and make a healthy salary teaching while broadening their notoriety. The Meishan studio where Josh and Gerran taught during their first days in China is a world apart from their stomping grounds in LA. The studio is located in a typically non-descript Chinese mall. Aging concrete facades and a glut of uninspired signage face a tiled courtyard pockmarked with missing squares. In the stairwell leading to the studio there is a promotional poster featuring smiling pictures of the two dancers. The studio owner has added a picture of Justin Bieber standing next to Will.i.am, under the misapprehension, he admits when asked, that the Will.i.am figure in the picture was one the dancers. The unattainability of American choreography, and dance pedagogy, contributes to its coveted status in China. When my fiancé graduated from the Sichuan music conservatory, she wanted dearly to study dance in New York. She applied and was accepted into the Broadway Dance Center but was rejected for a student visa by the US government when she applied. Optimist that I am, I encouraged her to re-apply, and she was subsequently rejected 3 more times, each time arriving at the consulate with a larger folder of documents supporting her application, and each time leaving with a heavier heart at the sense of a shrinking horizon of opportunity. Dance naturally appeals to a broad spectrum of Chinese youths because it is a hybrid – it is a wholesome activity, but it contains the seeds of individualism. Some young, ambitious, upwardly mobile dancers get their chance to study in America, and return to be premium teachers in China, but for the numerous others that can’t pursue their craft abroad, studying with American dancers in China may be their best chance to fulfill long-held aspirations. The studio in Meishan turns out to be quite large – nearly 900 square meters – and the dancers are enthusiastic and focused, though predominantly young and inexperienced. Josh and Gerran teach 4 classes over two days, whipping their limbs around with exuberant precision, and exhorting the class full of timid teenage (and teenage looking) girls to break out of their shell, to not be ashamed, and to feel the beat. One student attempts to translate the idiomatic phrases of the teachers into Chinese for her classmates, and they clap emphatically with half-understanding. After the workshops, the teachers regroup, waiting for the arrival of the car that will take them back to Chengdu. They are tired. They have taught for the past seven days, and are scheduled to teach for the next five. I ask Josh how the classes went. ‘I think it was the first time taking a real dance class for a lot of the students,’ he says with a sigh. ‘I think it is was their first time seeing a real black person,’ pipes up Gerran. ‘Oh that’s definitely true,’ says Josh, and we all laugh. For American dancers in China, spreading an ethos of self-love and free expression to Chinese students living in tremendously confined social and cultural worlds is a heroic task, and one with no end in sight. 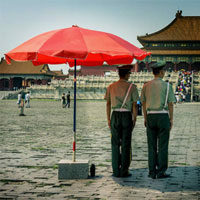 As long as China’s middle class continues to grow, as long as American soft power persists, as long as there is a need for convenient urban hobbies that can be fully enjoyed in an empty room with only a mirror, there will be a love for dance in China, and a demand for the ambassadors of the art. The car is running late and there are students in Chengdu waiting for Gerran and Josh to meet them at a KTV (karaoke bar) when they get back. It will be a rare chance for the students to get to interact with their teachers outside of class. For Josh and Gerran it is the last activity in a long day, and they waver in their desire to attend, anticipating the barrage of attention that awaits them. Neither of them is in the mood to go out, but they decide to go anyway, knowing how much it will mean to the students. Sascha–as usual, you nail it. It’s always interesting for me to read “the West comes to China” kinds of stories with subjects such as dance being brought to China by Westerners and being fully embraced by the Chinese. It makes for exciting times to be here in the ‘du and in the Middle Kingdom, and it makes me long to stick around just for a little while longer and longer. I see the enthusiasm, excitement, and hunger in my students and in the youth here to embrace the other cultural aspects from the outside world more and more. Not to steal an advertising motto and sorry for the sad cliche, but I’m lovin’ it. This was actually written by Eli, and he did nail it. I will fix the author page now to reflect the true hammer. RIght on! My props to Eli. A lot of my friends live in Chengdu these years. They love the city and seldom come back to their hometown, where I live now – Guilin. Great article, Eli. 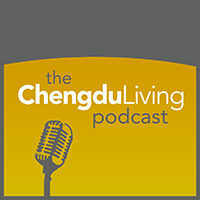 Do you know if Josh and Gerran are still teaching hip-hop in Chengdu? If so, where? I’m moving to Chengdu next month, and would love to take classes if they are. I between 4-13 November I will be in Chengdu for a city guide news and I want to make an interview with you about the city and life in Chengdu. Any advises or suggestions will be appraciated.